After being told for weeks that the Democratic presidential race was effectively finished, the Democratic primary voters of Indiana decided that they would like to see the contest continue. Bernie Sanders defeated Democratic front-runner Hillary Clinton on Tuesday by a comfortable 52.5-to-47.5 margin in Indiana, securing for the senator from Vermont his 18th state victory in a Democratic contest that many analysts said was over after Clinton won critical primaries in New York and Pennsylvania. The former secretary of state remains the leader in the race for the nomination, with a clear advantage among pledged delegates and an overwhelming advantage when superdelegates are added to the total. But the Indiana win allowed Sanders to declare: “I understand that Secretary Clinton thinks that this campaign is over. I’ve got some bad news for her…” And it allowed Sanders supporters to talk about taking their campaign to more primary states—Kentucky, West Virginia, Oregon, Montana, New Jersey, California—and on to the Democratic National Convention in July. “In the days and weeks ahead, the Political Revolution is going to continue winning states, winning delegates, surprising skeptics, and ensuring that our call for populist progressive change is heard loud and clear in Philadelphia,” said Charles Chamberlain, the executive director of the pro-Sanders activist group Democracy for America. The Indiana win was an especially sweet one for Sanders, as it resulted from intense campaigning on an theme that has long been central to his economic message: the need for the United States to abandon corporate-friendly “free trade” policies and to embrace a worker-friendly “fair trade” agenda. On a primary night when media coverage focused obsessively on billionaire Donald Trump’s “big” win in the Indiana Republican primary (a win that formalized his status as the GOP’s presumed nominee), Sanders was running only slightly less well among Democrats than Trump was with Republicans. The Vermonter was carrying the vast majority of Indiana’s counties and winning blue-collar towns that have been battered by the North American Free Trade Agreement, permanent normalization of trade with China, and a host of other global agreements that have undermined workers, communities, the environment and democracy itself. The trade issue was vital for Sanders in Indiana, as it was for him in Michigan—the state that shook up the race in March by handing the senator a surprise victory over Clinton. Exit polls found that nearly two-thirds of Indiana Democratic primary voters said Wall Street hurts the economy, and 46 percent said free-trade policies costs jobs. Sanders has made his opposition to the trade policies long favored by so many Republican and Democratic party leaders a core tenet of his presidential run from the day he announced his candidacy. During the course of the long battle for the Democratic nomination, Clinton has moved toward a more critical stance on trade issues—raising objections to the Trans-Pacific Partnership deal that she had once talked up as a potential “gold-standard” agreement. But Sanders has been unrelenting in his opposition to the TPP and past agreements, which he ardently opposed as a member of the House and Senate. During a week of intense campaigning across Indiana, where polls had suggested Clinton was in the lead, Sanders raised the volume on the trade issue. Since the enactment of NAFTA during former President Bill Clinton’s first term, Sanders noted, Indiana had lost 113,000 manufacturing jobs. 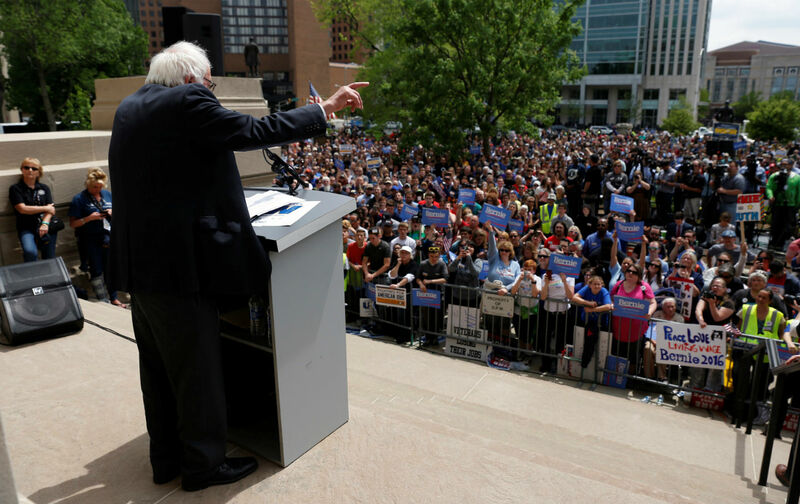 “Look around Indiana and you will find once vibrant and strong manufacturing towns like Gary, South Bend, Muncie, Bloomington, Indianapolis and Evansville shattered by abandoned factories, shut down steel mills, sky-high poverty rates and foreclosed homes,” Sanders told a crowd that included members of United Steelworkers Local 1999, which represents workers at an Indianapolis Carrier Corporation plant that United Technologies has targeted for closure. Campaigning across Indiana during the week before the primary, Bernie Sanders raised the volume on the issue. More than 1,400 Carrier jobs in Indianapolis will be lost if the company follows through with plans to move operations to Monterey, Mexico, next year. Seven hundred more jobs are expected to be lost in Huntington, Indiana, where United Technologies is preparing to close another facility. As the primary approached, Local 1999 gave a big endorsement to Sanders. While national media do a lousy job of covering trade debates, workers in states like Indiana know the issues well. And they know the records of the candidates on those issues. That understanding of trade policy runs deep in states like Indiana. It counts for more than polls and pundits and what media and political elites have to say about where the Democratic race stands. It may not be sufficient to change the course of the race. But, as part of a broader set of issues that speak to a sense that the economy is “rigged” against working people, it will keep the Sanders campaign going for a good bit longer.